So some of the RIT Dubai students organized a bus to take us to this place called Global Village. We were supposed to get to the RIT campus to catch the bus at 4:50. After waiting for our taxis for an hour and half (they said there was a "delay") the bus ended up just coming to Etisalat Academy to pick us up. The awesome Baliwood dancer dudes. You should have seen some of their costumes later in the show. I'm talking like sequence covered long vests with fur along the edges. Global Village was awesome. There were big pavillion entrance type things for all these different countries. You would walk in and see a ton of different vendors, booths, and merchants all telling you to come to their place and buy stuff from that country. There were live preformances throughout the entire night, including some gnarly Hungarian basketball trick dunk team, some really shiny costumed Indian Baliwood dancers, and these really muscley black African acrobat dancers. There was food from everywhere. On one side of the place there were even carnival rides (I didn't go on any). 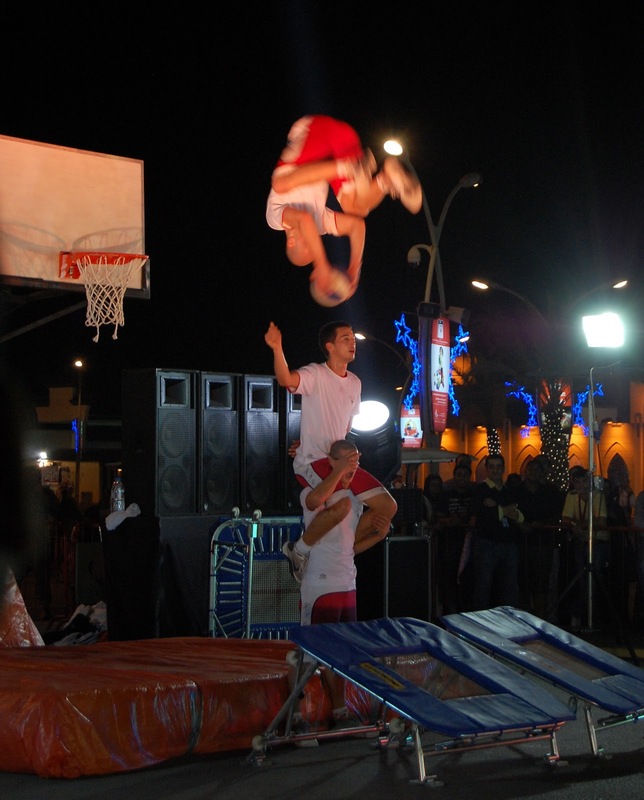 The Hungarian basketball dunk team doing some crazy flipping dunks. We went into Africa, Iraq, Afghanistan, Pakistan, Egypt, India, Qatar, and a bunch of other countries I can't remember. When dinner rolled around, after much debate (becuase there were so many good choices) Mike Walsh and I went to this Egyptian food place. I asked the guy what the best thing on the menu was and he pointed to a dish called Koshare. Turns out it was delicious. Imagine macaroni noodles, with rice, spaghetti noodles, lentils, and chick peas all topped with an awesome chili sauce and some type of crispy meat. Okay so I don't actually know if that sounds good, but trust me, it was.